Young adults follow the news less closely, and they have more negative attitudes about the news media. But they are more likely than their elders to get news online. 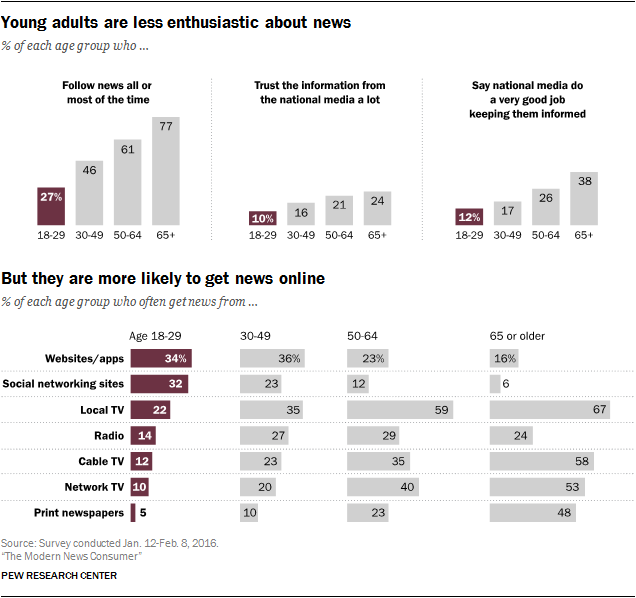 Those ages 18-29 are less interested in local and national news, and they discuss the news at lower rates compared with those older than them. They are also less likely to get news often from legacy platforms like TV and print newspapers. 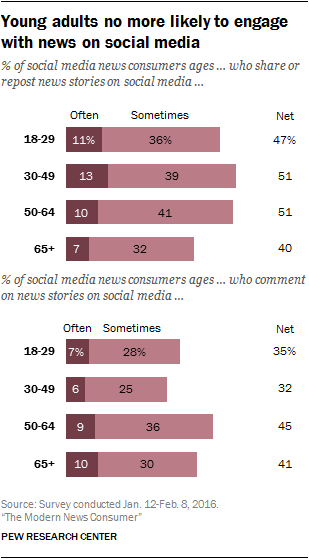 But when it comes to the news in the digital realm, these young adults outpace their elders. About a third often get news from social networking sites (32%) and from news websites and apps (34%). Their use of social networking sites for news is higher than among any other age group, while their use of news websites/apps is higher than that of those ages 50 and older. Attitudinally, they are more negative toward the news media, displaying lower levels of both approval of news organizations and trust in the information they get from them. But earlier research by Pew Research Center found that they are no less trusting when it comes to specific news sources with which they are familiar. In other words, while they may be less trusting of the media in general, when it comes to news brands they’re familiar with, trust is less of an issue. Despite this digital focus, young adults are no more likely to engage with news on social media than others. The fact that young adults have greater interest in news on social media does not result in greater engagement with news there, as they are no more likely to share/repost news stories or comment on news stories than others. Despite their lower levels of news interest in general, on social media, those ages 18-29 are at least as likely as others to often click on links to news stories (30%, which is on par with those ages 30-49 and higher than those 50+).